﻿ Best Price on Casa Del Sol in Santo Domingo + Reviews! 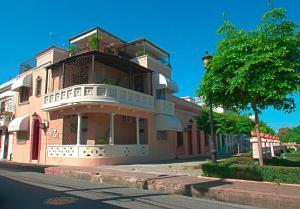 Casa Del Sol is located in Santo Domingo, in the city’s scenic Colonial Zone. The property offers free WiFi, free breakfast and on-site parking. Each air-conditioned room here features modern décor and comes equipped with a flat-screen TV with satellite channels, a safety-deposit box and a fan. The bathrooms include free toiletries. At Casa Del Sol you will find a tour desk and a shared terrace overlooking the Caribbean Sea. Restaurants, bars and shops can be found within a 5-minute walk. Santo Domingo City Center is just a 10-minute drive from the property, while Las Americas International Airport is a 25-minute drive away.